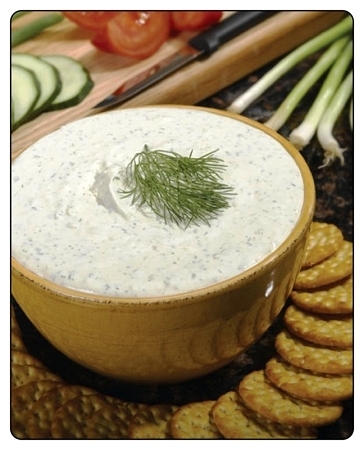 Use this delightful dip with chips and/or crackers. We had been asked to add this flavor to our dip mix menu and it already has become a very popular flavor. For a Dip: Mix package with 3/4 cup mayonnaise and 1 1/4 cups of sour cream. As an option use just 2 cups of sour cream or yogurt. Low-Fat or Fat-Free products can be substituted. Refrigerate 1 hour before serving. For a spread or Cheeseball : Mix package with two 8 oz. bars of softened cream cheese. Put in refrigerator to harden just enough to form into a ball. roll in crushed crackers, chips, parsley or whatever you prefer. Serve with vegetables , crackers, or breads. Refrigerate 1 hour before serving.